This is my server cabinet! 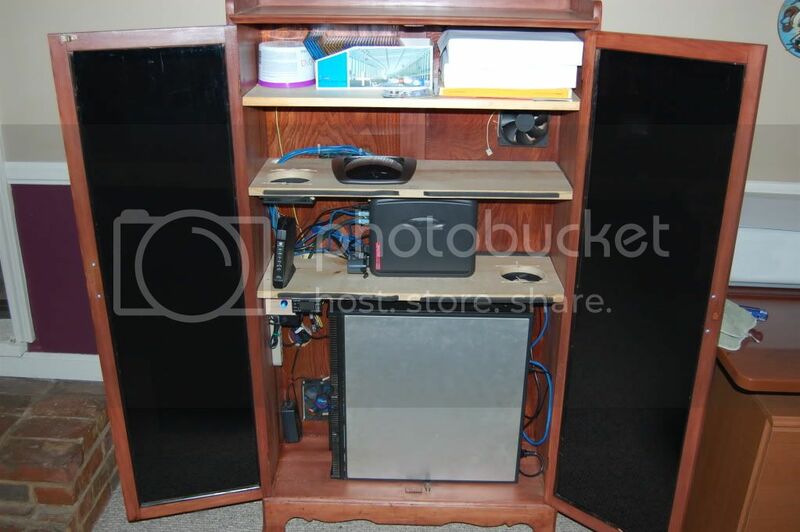 I needed a cabinet to hide some of my unsightly equipment and help me control dust. I also need the cabinet to keep my equipment cool without sounding like a 747. 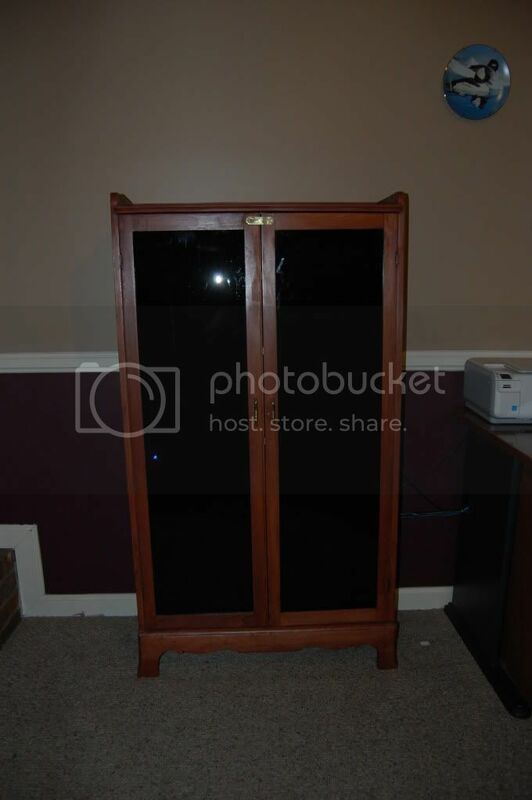 The original cabinet was an antique china cabinet that was passed down a few generations to me. I hate china cabinets so……… I turned it into a gun cabinet. I became uncomfortable with my guns setting out in my house because of my children. I did not want to get rid of the cabinet (family thing and all) so I decided to make it into my computer cabinet. I tinted the glass because I have a hatred for led lights and I did not want to see the stuff I was putting inside of it. Next I had vibrating resonance coming from the cabinet because of the fans. 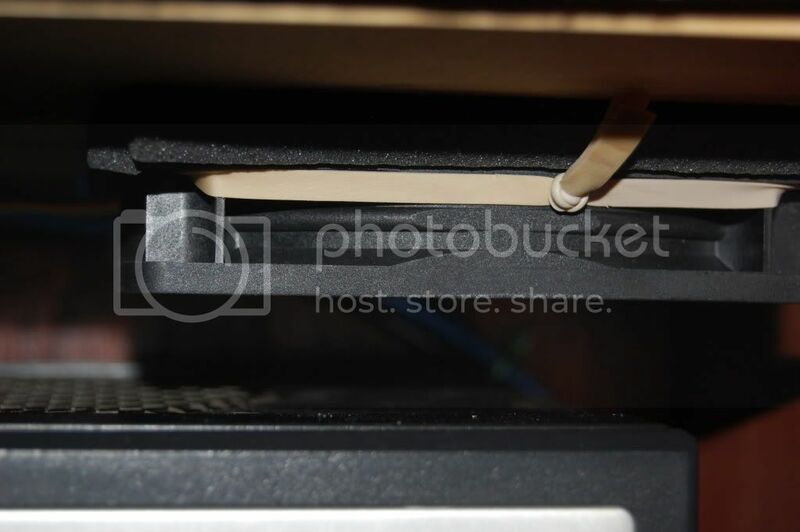 I isolated the fans using some weather stripping and mounted them with rubber bands. I never knew how noisy fans were until I mounted them to a wooden board. Right now I have my server (the P180case in the cabinet), UPS, Router, and modem in the cabinet. 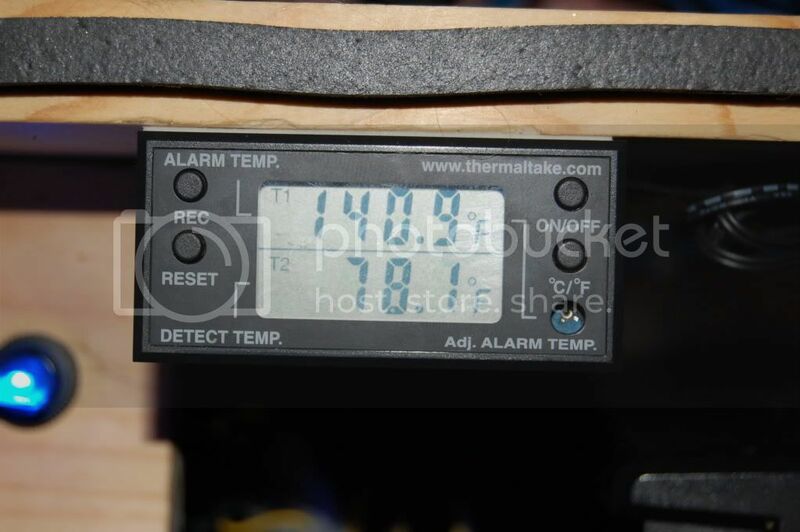 The temps on my HDD’s are really good. The server is running WHS and will be until I get a good hardware raid card. Then I will be switch over to Windows Server 2008 r2. I might use WHS2 if it comes out by then and has features that I want. why not put img tags around those pictures? We don't mind on here. This is a computer forum, so we probably all have high speed internet. As far as your project, you could get some pvc pipe and fittings to channel air directly into and out of the case. This would help if temps become an issue. What is the server being used for? So it works like apple time machine? If so, please tell me more. I really am sick of backing up my RAID0 array, so much that I am considering RAID10. I'm not sure how it works with Windows Server Edition, but with Windows 7 I have it set to make weekly backups from one drive to another. You can select certain folders or entire drives, it's quite convenient. I went a Looked at Apple Time Machine from what I gather from their website and what i know about WHS its the same concept on backing up data. Its a network OS. When you connect machines to it and install the "connector software" You set up the connector software and tell it what you want backup from your systems that have the connector software. To access these backups WHS literally Mounts the backup as another drive you can access it like any other drive. I know you can re-image your drive as well. I personally have never done a re-image with it. It also does File duplication and storage drive balancing. Remote access is offered in a browser based remote access of your files etc. It has a whole host of add-ins that can be used for such things like website hosting etc. I know i'm not covering all of its features. It needs very little to operate A 1 GHz CPU and 512 MB of RAM is all that is required. Any chance it could run on 800MHz? I have a Mini ITX VIA C3 board that has been sitting around doing nothing. It probably would. Your CPU usage might be maxed out alot of the time. WHS is a Windows 2003 server shell. Hell I would try it. 30 day free trial on it. Thats what I did. I had a junk PC. I put the free trial on it decided I liked it and purchased it 1 week later.